New NEC SV8100 phone system platform meets business demands for efficient, seamless communication to enable rapid decision-making and customer responsiveness. Telephone Magic offers the SV8100 to help small to medium-sized businesses succeed by placing people at the center of communications. The SV8100 business phone system functionality goes straight to your mobile phones. The SV8100 Mobile Extension feature is like being in when you’re out. Treat your mobile like your desk phone and enjoy system features while you’re on the move. The NEC SV8100 phone system is a unique IP communication solution for any small and/or medium businesses. Whether a small company has 5, 25 or up to 500 employees, just getting started or already established, have a single office, a home office, or multiple stores/sites, the NEC Univerge SV8100's ability to expand means it can work at any level, from a technically superb phone system, to a truly advanced unified communications platform. 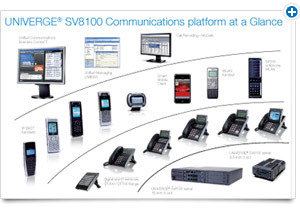 The SV8100 phone system unifies your communications. It providing employees with a solution that lets them handle all their business communications on the device of their choice: their laptop, mobile phone, office phone or home phone — all this while using wired, wireless or broadband connections. New Smartphone Unified Communications features such as Mobile Extension and Voice Mail to Email allow staff to stay in touch even when they are out of the office or, wearing many hats at once, which is often the case for small businesses. Telephone Magic Inc., is an online leader in NEC phone systems and telephones and offers the NEC SV8100 phone system at wholesale prices. Jeff Jackson, president of Telephone Magic, notes, "The SV8100 business phone system functionality goes straight to your mobile phones. The SV8100 Mobile Extension feature is like being in when you’re out. Treat your mobile like your desk phone and enjoy system features while you’re on the move. Best of all, Mobile Extensions are built in at no extra cost to the SV8100, and that means great value for our clients." The NEC SV8100 Communications Server's modular construction is suitable for growth. It is the ideal system for businesses that wish to compete and expand. You can deploy a pure IP solution or any combination of IP and traditional circuit-switched technology with a single SV8100 system. Jackson notes, "NEC SV8100 telephones and handsets are like no other. Their modular construction means you can chop and change the design for exact business requirements. They can then be upgraded at a later stage without having to replace them – a great investment protection." "UC for Business helps unify an entire organization, enabling individuals, departments and locations to work more efficiently by ensuring seamless internal and external communications" continues Jackson. "Users can connect and show presence from wherever they are via phones, PCs, mobile devices, faxes and the web - effortlessly." NEC Univerge SV8100 digital phones offer features and benefits that brilliantly capture the essence of form and function while providing businesses the means to seamlessly communicate with their customers. The SV8100 range of NEC IP telephones offers a more flexible way of working. Access to the main system features means employees are more reachable, more quickly. Jackson concludes "NEC telephones, which are an important part of NEC’s SV8100 approach, deliver exceptional value and can be customized to fit your organization’s needs. With their user-friendly ergonomic design, a range of models to choose from and a choice of interfaces and options, they provide users with access to the full power of NEC Univerge communication platforms."